“Type stuff in, see what happens!” is how Terry Cavanagh describes his latest game, Constellation. It’s a simple pitch that belies a mind-bending journey of free association. The free, browser-based PC game was commissioned and created for Now Play This 2017, a small alternative gaming festival hosted at the Somerset House in London. For an art game, it’s extremely approachable. Like Cavanagh’s past projects, such as Super Hexagon and VVVVVV, Constellation is easy to pick up and play. Unlike those games, however, it trades twitchy arcade action for abstraction. Constellation starts with a blank text cursor blinking on a black screen. You can type anything. I started with “hi,” which prompted a bunch of different coloured two-dimensional “hellos” to drift through the void. Knowing nothing about the game, I tried to start having a conversation. Maybe if I typed down into the abyss the abyss would type back. But that’s not the kind of game Constellation is. Type “abyss” and nothing happens. The game works best when you start throwing nouns and adjectives at it. Type “ocean” and the game will transport you there using low res pictures of an actual oceanscape combined into a 360 degree view. Using the mouse you can drag your perspective to get a better look in any direction, while typing things like “in” and “out” functions as a zoom. From there things can get really weird. At one point I was standing in a forest clearing I’d gotten to by typing “tree.” It was snowing, and the flakes were big, clumpy and blue. I felt lonely, so I typed “friend.” At first I didn’t see anything change. Since objects in Constellation sometimes pop into the world just outside of where you’re looking, I typed “friend” several more times. Seconds later I was surrounded by giant, floating ants. These were not the friends I’d requested. For a game that seems to give you all of the power, creating a world based on the things you type, Constellation is full of surprises and little nuances that make it truly feel like a game rather than just an internet toy. You can control the words dropped into the command prompt but not the idiosyncratic interpretations of them the game uses to generate new images and destinations. Constellation feels like having your subconscious rendered by a very specific person: Terry Cavanagh. In my head, a sequence of the words like “snow,” “breakfast,” and “infinite” gets me to a cosy diner early in the morning in the middle of winter. 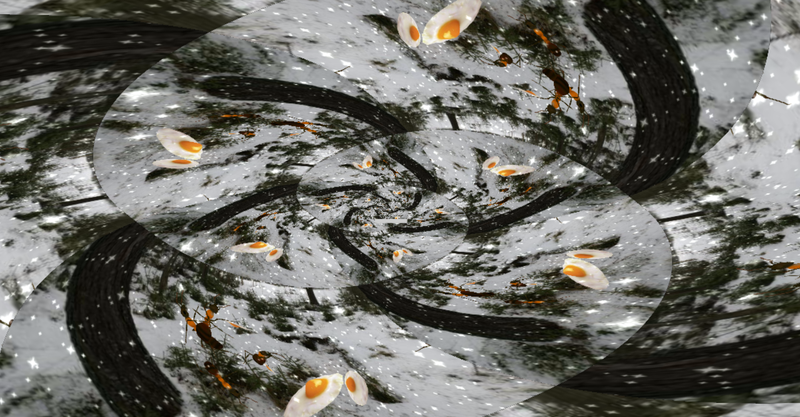 In Constellation it creates a vortex of fried eggs flying at you from every direction. Fortunately there’s always some place new to go, or you can always refresh the browser and start from scratch.